Works for Many DIY or Universal Setup Applications. This is an Universal DIY kit, Might need modification and other items to meet your project needs. 45 Degree Aluminum Pipe x2 75 Degree Aluminum Pipe x2 90 Degree Aluminum Pipe x2 Straight Aluminum Pipe x2. 3 Straight Silicon Hose x8. 3 Stainless Steel T-Clamp x16. 3 Aluminum BOV Flange Pipe x1. Intercooler Tube & Fin Intercooler Core Size: 23.5x11.5x2.75 inch Overall Size: 30.75x11.75x3 inch Inlet and outlet sizes: 3 inch. Piping Kit: 3 polished Aluminum Piping Parts All Pipes are 2mm Thick, Better Quality than other thin ones. Other Thinner Pipes won't survive welding. Each Pipe has Rolled Edge Inlets (Except J pipe) Each pipe is 18 long Each Pipe is Individually Warped with Protection All Hoses are 3 Layer Enforced Silicon Hoses All Clamps are Stainless T-Clamps. Piping + BOV & Flange Pipe + Silicon Hose + T-Clamp. We sell our products internationally. PR, Guam, VI, AK , APO, HI. 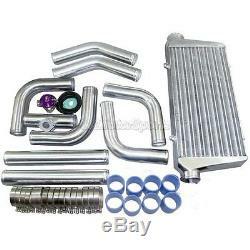 The item "CXRacing UNIVERSAL FRONT MOUNT TURBO INTERCOOLER + 3 PIPING + BOV KIT" is in sale since Thursday, September 22, 2011. This item is in the category "eBay Motors\Parts & Accessories\Car & Truck Parts\Turbos, Nitrous, Superchargers\Turbo Chargers & Parts". The seller is "cxmotorsports" and is located in Temple City, California. This item can be shipped worldwide.